Mr Singh looked weary and unshaven, his uniform somewhat wrinkled, which actually made us feel more relaxed. He was always trying to be a bit too formal. In every destination there is a drivers rooming house which at times can just be a roof over a bunch of cots. Maybe the room was full and Mr Singh slept in the car. Its hard to say. He was very quiet about his personal life no matter how hard we pressed to know more about him. If he did sleep in the car, there was no proof of it. “How much time madam?” he asked Gretchen, his way of asking what time it was. We told him the time and offerred to buy him some breakfast but he refused. He told us he had eaten already. I’m not sure he did but we got in the car and headed off to Johdpur, supposedly a 6 hr drive. The road to Jodhpur was a 6 hour drive. Every destination was a 6 hour drive, but we were in no hurry. A little over 30 km from Bikaner, we made our first stop the Karni Mata Temple at Desnok, The Rat Temple. 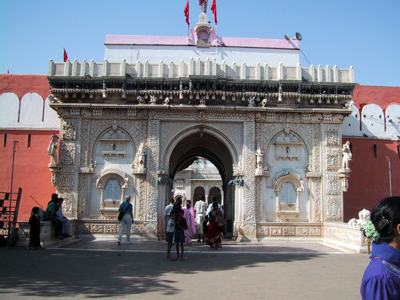 Shri Karni Mata, the incarnation of the Durga, Goddess of Power and Victory began her miracle working in the area at the age of 6 when her father was bitten by a poisonous snake. She just touched the wound and he was healed. The temple in Desnok is a very popular site for pilgims seeking her blessings. 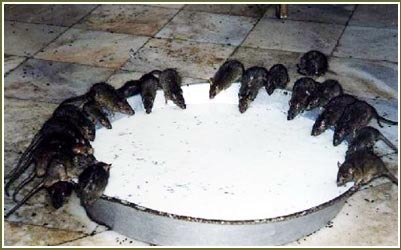 As the legend goes, the devotees of Shri Karni Mata who have died in or near Desnok are reincarnated as Rats, called “Kabas”. 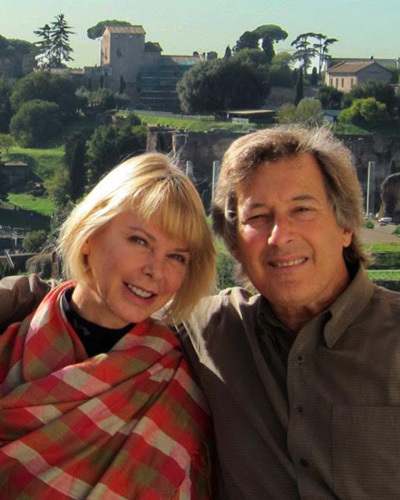 The Kabas live in the temple. They are totally domesticated and are more like pets than wild rats. 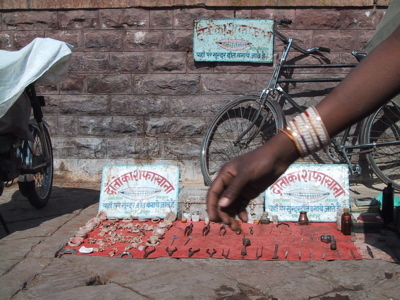 Since the belief is that they are the followers of Karni Mata, they are treated as devotees of the Temple. They drink milk from a bowl, they sit on the pilgrims laps, they are cared for by the temple. It’s all rather charming, in a charming rat kind of way. We arrived to theUmaid Bhawan Palace late in the afternoon to find there was a problem with our reservation, but someone from the back of the reception came out and told us don’t worry, everything would be fine. And it was. The room they gave us was enormous. It literally took well over a minute to walk from the bedroom area to the door when the porter came with our bags. Yes, you must use the porters. It is most impolite to carry your own bags. After they deliver the bags, they bow from the waste but keep their heads looking at you. It’s the signal to leave the gratuity. 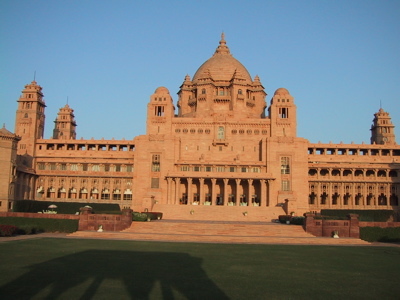 The Umaid Bhawan was one of the last royal Palace built in India. It accomplished two goals; one to build a Palace for Maharaja Umed Singh, the other to provide work for the poor who were going through one of the worst draughts in India’s history. There are 347 rooms in the hotel, now a 5 star hotel run by the Heritage Hotels of India. The present owner is His Highness Gaj Singh, The Maharaja of Jodhpur still lives in one of the wings. As we were walking the gorunds one night we heard the TV in his apartments. He was listening to “The Eastenders”, a BBC show about families in the London’s East End. He was probably remembering the “good old days” of colonial India, before all his wealth was taken away by Indira Ghandi. Jodhpur is the second largest ciy in Rajastan (Jaipur is the largest). Before our visit all we knew about the city was it was the origin of the famous Jodhpur pants The breeches were created for the Maharana who loved Polo, a very big sport in Jodhpur. From there, they became the rage in London and on through the empire until they finally became de rigeur for stereotyped Hollywood film directors. By the way, I hear the pants are making a comeback.. You can see lots of photos of the Maharaja wearing them in the Palace museum. You can also have them custom made for you but you’ll have to wait a few days to pick them up. 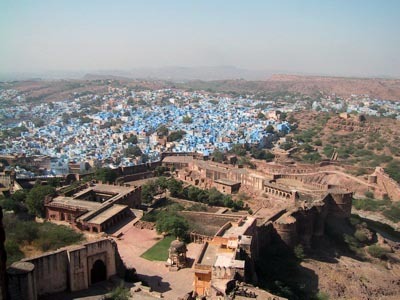 Jodhpur is known as the Blue city becauseall the roofs of the houses in the city are painted blue. originally this was to show which houses belonged to the Brahmins (blue is their color), but eventually everyone got into the custom. They say it keeps away the mosquitoes. When I lived in New Orleans, the locals painted the ceilings of their fronts proches this same color blue for the same reason and I can attest, mosquitoes don’t like it. I have no idea why it works. It just does. Recently, my father had me put a bar of soap at the foot of our bed to prevent leg cramps. Once again, I don’t know why it works, it just does. 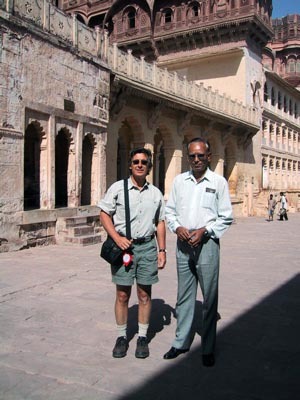 The 15th century Mehrangarh Fort sits 400 feet above the city. It is an imposing site both above and below. Our guide, Mr Yashwant Singh (we’re begining to think that everyone related to the tourism industry is named Singh) took us through the beautifully carved palaces and museum collections including a 9′ tall baby cradle that belonged to the last Maharaja born in the Palace. Nothing was done on a small scale here. The city below the Fort is a sprawling marketplace filled with food, spices, cloth and professional services. You want a haircut, no problem, just have a seat on my blanket. You need dental work, no problem, just sit right here. The dentist will be right with you. Mr Singh(Johdpur Singh) brought us over to the Jodhpur Bazaar to meet his friend Mr Jain, “the best wallah in all of India for pashmina and Indian cloth”. Gretchen was definitely in the market for pashminas and so we figured why not. We knew the routine.Mr Singh would bring us in and if we bought anything, he’d get a small commission on the sale. Usually for sales like this, the shop keeper will add on an extra price to pay for the commission but in India everything is so inexpensive we didn’t care about the surcharge. We were greeted by a shop employee but soon Mr Jain, himself appeared. He smelled a sale and in less than a minute, we were drinking tea and watching one beauiful bed cover after another, ancient hand sewn Mughal sashes, quilts assembled by village women in far remote parts of Rajastan, 17th century bronze statues (I’m looking at one of them on my desk as I’m writing this) and Indian pashminas, those sought after finely woven shawls made from the underbelly of a special breed of goat that only lives in high in the Himalayan mountains. 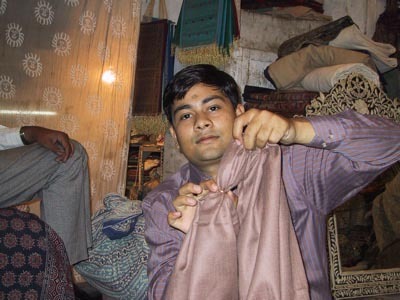 Mr Jain informed us (along with all his other grand stories) that Indian pashminas were far superior to any other. As proof of how perfect they were he showed us the only way to tell if the pashmina is of very high quality, is if it will slide through a ring. He removed a gold band from his finger and showed how easy his products slid though the band. That’s all we needed to see. We bought 8 new pashminas, 2 antique pashminas, 4 bed covers, and one small bronze statue (purportedly to be from the 17th century) of Hanuman, the monkey god standing on top of an elephant. I’m a big fan of Hanuman, the patron god of learning, music and mischief.